Happy New Year from One Fish Foundation! 2016 was a year of continued growth, broadened horizons, hands-on experiences, shared stories and several firsts. 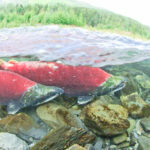 One Fish remains committed to educating students, parents and communities about why they should care where their seafood comes from, how it was caught and by whom. Here are a few of the highlights from the past year, including some important firsts that set a precedent for spreading the sustainable seafood message in communities. The first sustainable seafood dinner was staged at Rosemont Market in Portland in June, bringing interested residents to the historic bakery to have a frank, thoughtful discussion about myriad factors affecting seafood choices. The KNOW FISH dinners hosted at When Pigs Fly in Kittery, Me. and Black Trumpet in Portsmouth, NH. extended the discussion of the June event to include fishermen, chefs and fishmongers talking about different links in the seafood supply chain. 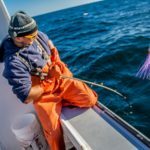 Attendees learned about one fisherman’s unfailing drive to catch groundfish such as haddock and pollock by hand, on rod and reel, up to 80 miles offshore to reduce bycatch and preserve the species. 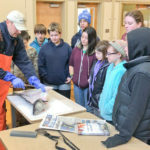 One Fish Foundation expanded its educational reach into New Hampshire schools. One Fish Foundation helped plan and attended Slow Fish 2016 in New Orleans, an international event aimed at sharing fisheries stories from around the world and addressing some of the challenges to fishermen and seafood sustainability. We have set some ambitious goals for 2017. We will hire a social media communications coordinator to expand One Fish Foundation’s presence on Facebook, Instagram, and Twitter. We will extend the website to include more content for students. We will grow our footprint in Maine, New Hampshire and Massachusetts. We will host more KNOW FISH dinners along the coast, inviting more fishermen and chefs to share stories about seafood sustainability and offer tips for consumers. We will launch a newsletter that brings the latest news and events regarding sustainable seafood and what’s going on at One Fish Foundation. Hats and T-shirts sporting the One Fish logo will be available online, proceeds directed toward the foundation. One Fish will attend key conferences focused on the front edge of seafood sustainability issues, including climate change impacts, policy changes, new science, community involvement, etc. It’s going to be an exciting year. 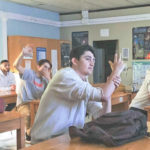 Through the blog, the KNOW FISH dinners and in the classroom, we’ve found one inescapable truth: change happens one conversation at a time. The more people we can reach with the message about learning where their seafood comes from, the more we can improve the resource, and the lives of the fishermen who depend on it.